Wearing a tassel at graduation is a timeless tradition, and has become an essential part of any graduation ceremony. A graduation tassel is worn by wrapping the loop of the tassel around the button on the top of a traditional graduation cap, and dangling the tassel over the front left side. The tassel is later turned from the left side to the right, signifying the change from student to graduate. While black is the traditional color worn for graduation, most schools have a preferred tassel color that coincides with school colors, represents graduation in a specific field, or designates an honor student graduate. 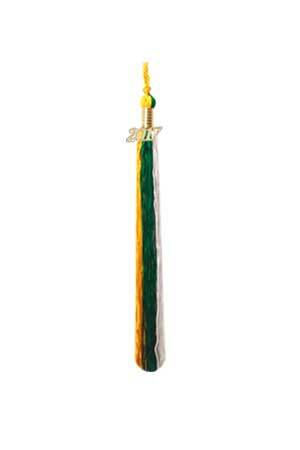 One of our more popular options is our gold, green, and white graduation tassel. Split into three very common school colors, this tassel is an excellent choice for any graduation ceremony. Gold, green, and white graduation tassels represent the patience, persistence, and reward involved with completing an education. Meant to stand as a lasting memento of academic success and to inspire lifelong learning, the gold, green, and white graduation tassel is sure to help your graduates feel proud of all they have accomplished, and hopeful for the future. A gold, green, and white tassel is sometimes used to denote graduation from major studies in the biological sciences, but can also represent any number of other studies, or accomplishments. However you choose to use the gold, green, and white graduation tassel, it is sure to be the perfect finishing touch on your commencement exercises. At Honors Graduation, our main goal is the satisfaction of your students and the success of the graduation ceremony. Our gold, green, and white tassels are made from high quality synthetic materials, making them both durable and beautiful. Plus, at such low prices, you can rest assured that you are getting the best possible deal. Order your graduation tassels from Honors Graduation now!